Parent Teacher Conference Scheduling, EASY! 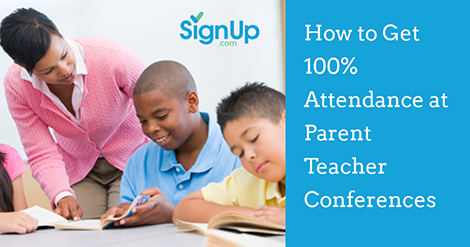 Every teacher hopes for 100 percent participation when it comes to Parent Teacher Conferences. Research shows that family involvement improves school performance and social skills and can be a predictor for student success. Follow these three easy ideas to organize, schedule and remind parents for your easiest and most successful conferences ever! 1. Schedule Parent-Teacher Conferences Online: Use free, online Parent Teacher Conference SignUps to not only schedule conferences with parents, but also remind them so they don’t miss their appointments. 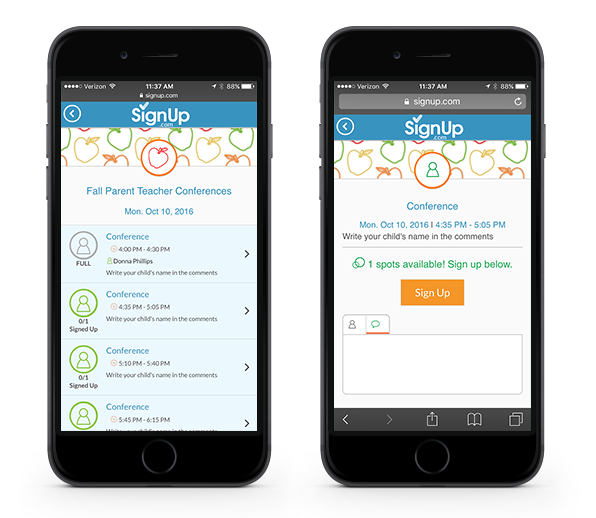 With SignUp.com it’s easy and quick to schedule parent conference times for single or multiple days and also for recurring office-hours. Parents love that they can choose their appointment in about a minute from their smartphones, no password required. Both parents and teachers have access to the schedule 24/7 from mobile devices, and easy calendar syncing keeps everyone up-to-date in real time. 2. Make Use of Technology to Reach Parents: Today’s technology makes it easier than ever to have meaningful conferences virtually. Using Skype, Facetime or Google Hangouts, parents can connect from almost anywhere, and it’s free! The easier you make it to connect, the more likely you are to have an engaged and successful parent-teacher relationship. 3. Encourage Two-Way Communication: Although the amount of time allotted for student conferences is usually short, make sure you leave a few minutes to allow parents to offer feedback, express concern or ask questions. If the conversation seems to be running long, ask parents to schedule a longer conference at a later date. Parents are more likely to support your efforts at home if they feel valued and heard.